I'm considering insulating (and drywalling) my garage, which already has insulated garage doors. My main goal is to keep it from getting much below freezing during the winter. This garage is located in the North Cascades (2000' elevation) in Washington state, with a typical yearly temperature range of 0F - 105F. I'm not too worried about insulating the walls, but wonder: Do I need a vapor barrier? For the ceiling (rafters 24" oc) would it be easiest to place normal batting between the rafters and then hang the drywall, or hang the drywall first and then lay the insulation afterwards? Or would blown-in insulation be better? Which is typically cheaper? And again, do I need a vapor barrier? The space that will become the attic is vented via wall vents under the peak of the roof on both sides of the garage. I prefer fiberglass batting over blown-in insulation because it's not as messy, you don't have to rent a machine to do it so you can do it at your own pace, and if you need to do any subsequent work in the attic, it's easier to move it out of the way then move it back again later. I'm not sure about the relative cost, but I frequently see special offers for fiberglass insulation in HD and Lowe's so shop around. If you choose fiberglass, I would install the insulation before the drywall, just because you'll have more room to work in. A lot of fiberglass batts come with a paper vapor retarder. Since I started using this site, I've learned to put an extra sheet of plastic between the batts and the drywall, something I'll be doing in the future. Whichever type of insulation you go with, be sure not to block the vents. I've used baffles to allow air from my soffit vents into the main attic space after installing R-38 batts. I have a few questions and observations that will effect what you should do. First, I see that the peak (ridge) seems to be over the existing framed and drywalled wall. What is on the other side of this wall? Is this garage attached to the house or free standing? Do you have or intend to put any heat or heat dump register in this space? I also noticed that the roof framing is standard trusses, not attic trusses. Where is the attic space going to be located? If the attic space is going to be over the bay you pictured, then you are limited in the amount of insulation you can install and still have a floor for storage. If the collar ties are 2X6, then the most blanket type insulation you can install is R19. 2X4= R11. Fiberglass blanket would definitely be the most cost effective in a small space such as you have. I would use unfaced F/G, and a 4 or 6 mil plastic vapor barrier installed before you drywall. As for installing drywall, you really should install strapping at a max of 16" on center to mount your 5/8" fire rated rock to. 24" inch on center is too large for hanging rock overhead, especially 5/8" rock. 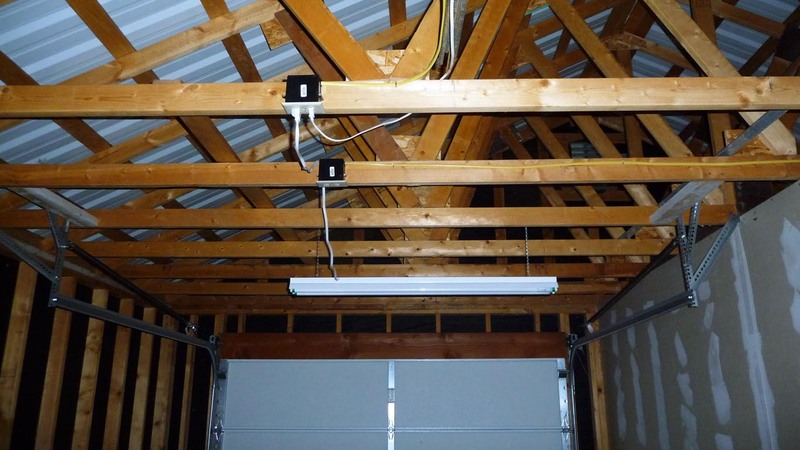 If garage is attached, 5/8" drywall is minimum code in most areas. I also noticed that you have a metal roof. Metal roofs are great, but are notorious for condensation. This makes it absolutely necessary to have a good vapor barrier and good venting to avoid potential interior "rain storms" lol. My other consideration would be insulating the exterior walls. Since there seems to be only one long wall and very little framed cavity wall on the gable ends, it would be advantageous to go ahead and finish the job by insulating and drywalling these walls. If you only do the ceiling, you will not have a good barrier to air, heat and humidity leaking by the ends of the ceiling at the wall plates and entering the attic area. This kinda defeats the whole idea of what you are doing. What are you meaning by "add strapping" with regards to applying sheetrock to 24O.C. ceiling? 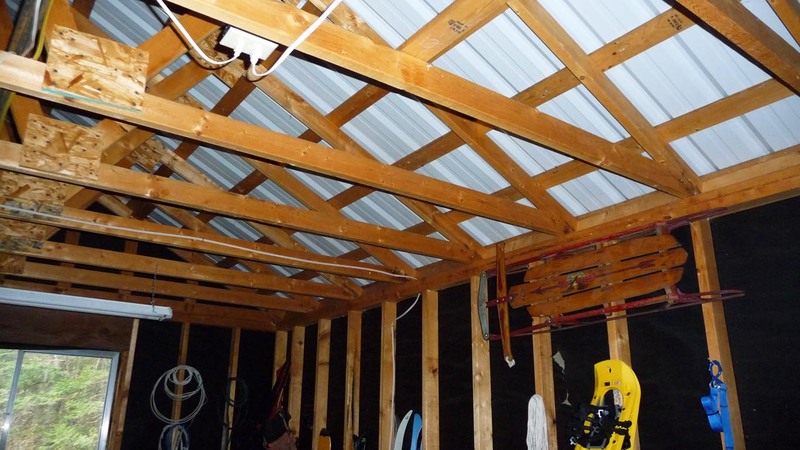 Should I install a vapor barrier on the bottom of my garage ceiling? Garage Wall Question- Insulation and vapour barrier? Is there something I can do after not putting a moisture barrier between grade and concrete of a garage? Is it okay to not have a vapor barrier in lightweight tiny house type construction?